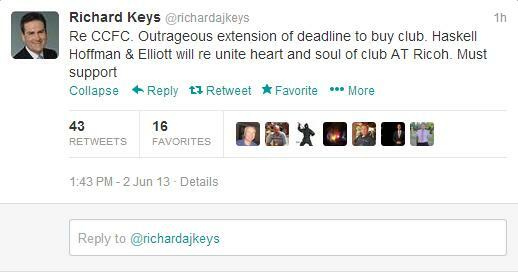 Richard Keys: Outrageous to extend bidder’s deadline. 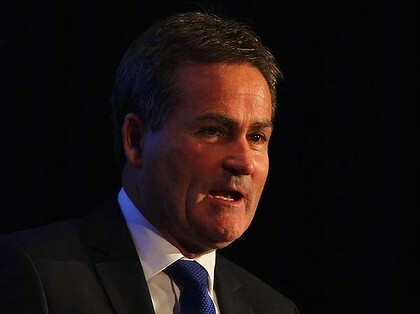 Former Sky Sports anchor, and current TalkSport host, Richard Keys. On Friday, which was the original deadline for bidders to make their move, joint-administrator Paul Appleton announced that the deadline was being extended until 5pm, Friday June 7th, a move Keys is clearly unhappy with. Keys has been a long standing supporter of Gary Hoffman and has also refused to go to Sky Blues’ games whilst current owners SISU are in charge of the club and described the owner’s as “slippery” in a later tweet on Sunday afternoon in response to a question asking how confident Preston Haskell IV, Hoffman and suspended Life President, Joe Elliott are in completing a takeover. The TalkSport host, alongside Andy Gray, his co-anchor on Sky Sports before they were sacked for their controversial ‘smash that’ remarks to pundit and ex-player Jamie Redknapp, also revealed that Haskell’s bid has been 18 months in the making and that they are hopeful of a positive outcome in the near future. Keys spent the rest of the afternoon interacting with, and answering questions from Sky Blues fans and you can join in by tweeting him at @richardajkeys. « Private Seat Licence owners demand money back from Coventry City.